That time of year has come again. The nights are shorter and the wind is starting to shake Britain in its shallow waters. So, in protest, balloon enthusiasts/pilots/crew are starting to head elsewhere to seek their much-needed adrenaline rushes. 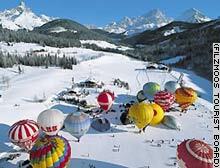 I myself am going to Filzmoos (south Austria) come January the 9th with Alba Balloons (a Scottish Balloon company). There, I will be taking part in the annual Filzmoos International Balloon Festival. Now as I sit here writing my blog entry in the office a wide grin appears on my face. I should perhaps tell you my age, only 19. That means every little ballooning adventure I go on currently is a notch on my belt. So being among the 40+ balloonists (mainly consisting of Austrian, German and other northern Europeans) is a big deal for me. So do you know what I say, “Bring on the British Winter!” and I tilt my hat to the ballooning community who, as always, continue to be friendly and welcoming to this young kid. For more information about other Balloon Festivals Around The World, contact our team for more details.